Meet Jabber, a Steller's jay born in the spring in a nest of pine twigs and mud. When summer comes, she grows feathers and learns to fly, just in time for the cold season ahead. 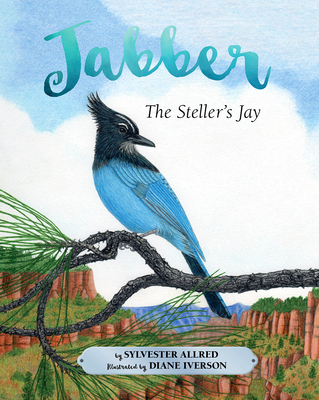 With beautiful illustrations by Diane Iverson, Jabber the Steller's Jay takes the reader through the first year of Jabber's life as she learns to survive along with the other animals who live in the ponderosa pine forest of the US Southwest with her. Includes a pictorial glossary of many of the forest animals that Jabber meets, including a red-tailed hawk, a tassel-eared squirrel, a porcupine, and a mountain lion. Dr. Sylvester Allred is a retired biology professor from Northern Arizona University. He taught over 20,000 students in his twenty-seven years at the university while conducting research on the ecology of tassel-eared squirrels within the ponderosa pine forests of the southwestern United States. In addition to teaching he has written five children's books, two of them set in the national parks, and The Natural History of Tassel-Eared Squirrels. His latest book, Ponderosa: Big Pine of the Southwest , was released in April 2015. He and his wife, Donna, live in Durango, Colorado, where they are very active hikers. Ms. Diane Iverson is illustrator and/or author of several children's books and a popular speaker at elementary schools. She has also illustrated books for adults. She and her husband, Doug, live just outside Prescott, Arizona, at the edge of the Granite Mountain Wilderness Area.